Fri., July 13, 2018, 5:19 p.m.
At Kentucky Speedway, Sparta, Ky.
1. (78) Martin Truex Jr., Toyota, 188.890 mph. 2. (20) Erik Jones, Toyota, 188.739. 3. (4) Kevin Harvick, Ford, 188.547. 4. (2) Brad Keselowski, Ford, 188.390. 5. (18) Kyle Busch, Toyota, 188.206. 6. (21) Paul Menard, Ford, 188.121. 7. (12) Ryan Blaney, Ford, 187.944. 8. (14) Clint Bowyer, Ford, 187.696. 9. (41) Kurt Busch, Ford, 187.630. 10. (31) Ryan Newman, Chevrolet, 187.071. 11. (19) Daniel Suarez, Toyota, 187.000. 12. (10) Aric Almirola, Ford, 186.884. 13. (3) Austin Dillon, Chevrolet, 187.169. 14. (17) Ricky Stenhouse Jr., Ford, 187.071. 15. (88) Alex Bowman, Chevrolet, 186.625. 16. (9) Chase Elliott, Chevrolet, 186.548. 17. (6) Matt Kenseth, Ford, 186.522. 18. (42) Kyle Larson, Chevrolet, 186.342. 19. (22) Joey Logano, Ford, 186.329. 20. (37) Chris Buescher, Chevrolet, 186.181. 21. (24) William Byron, Chevrolet, 186.143. 22. (1) Jamie McMurray, Chevrolet, 185.886. 23. (34) Michael McDowell, Ford, 185.465. 24. (38) David Ragan, Ford, 184.716. 25. (43) Bubba Wallace, Chevrolet, 184.533. 26. (47) AJ Allmendinger, Chevrolet, 184.483. 27. (48) Jimmie Johnson, Chevrolet, 184.420. 28. (13) Ty Dillon, Chevrolet, 182.846. 29. (95) Kasey Kahne, Chevrolet, 182.543. 30. (15) Ross Chastain, Chevrolet, 181.178. 31. (72) Corey LaJoie, Chevrolet, 180.385. 32. (23) JJ Yeley, Toyota, 179.868. 33. (00) Landon Cassill, Chevrolet, 179.104. 34. (51) BJ McLeod, Chevrolet, 177.883. 35. (99) Garrett Smithley, Chevrolet, 176.188. 36. (11) Denny Hamlin, Toyota, 0.000. 37. (32) Matt DiBenedetto, Ford, 0.000. 38. (7) Jesse Little, Chevrolet, 0.000. 39. (66) Timmy Hill, Toyota, 0.000. SPARTA, Ky. – Defending champion Martin Truex Jr. has won the pole for the NASCAR Cup Series race at Kentucky Speedway. 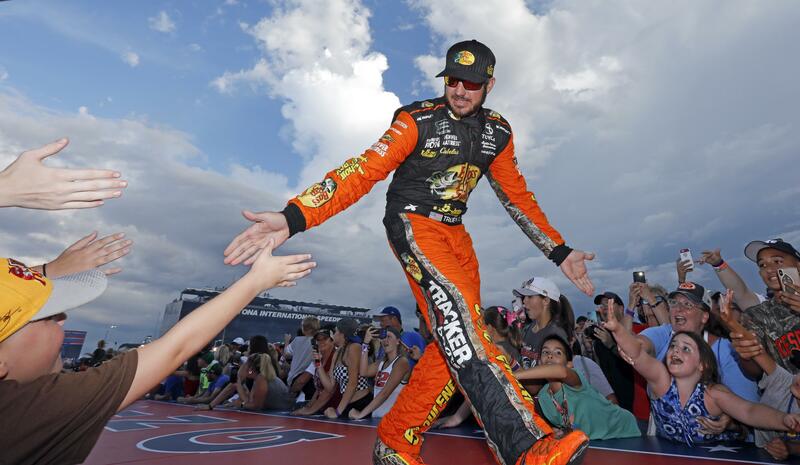 Truex clocked 188.890 mph to earn his first Kentucky pole and 19th of his career on Friday. He led 152 of 274 laps on his way to winning this race last July. Published: July 13, 2018, 5:19 p.m.